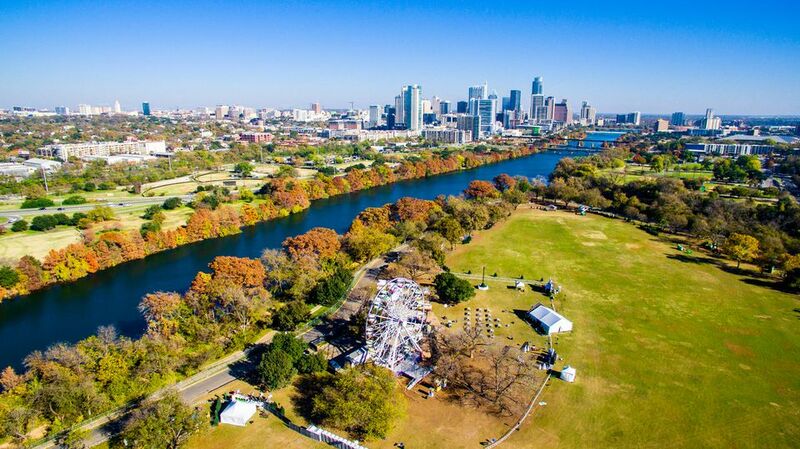 Located just south of downtown Austin, Zilker Park stretches across 350 acres of rolling hills. Barton Springs Pool, sometimes referred to as the “soul of the city,” lies at the center of the park. The rest of the park is a mix of open space and minimally developed land crisscrossed by hike-and-bike trails. The opportunities for organized and unstructured activities are virtually endless. Here are just a few of the fun things you can do in the park. Three underground springs in and around this pool supply 68-degree water year-round. In summer, the water can seem shockingly cold at first and then pleasantly refreshing once you get used to it. The three-acre pool is big enough to meet the needs of both serious swimmers and people just looking to cool off. In the early mornings, the pool is dominated by serious fitness buffs of all ages. They swim laps that run the full length of the pools. For those who just want to lounge around, there’s a designated area for floats. There’s also a shallow area for kids. Keep in mind that much of the bottom of the pool has been maintained in a natural state. You can dive down and see turtles and fish swimming along the bottom. The downside to this is that the pool sometimes contains algae, and plants growing up from the bottom can poke you unexpectedly as you swim over them. Bring snorkeling gear if you want the best view of the bottom. You can even find the source of one of the springs near the diving board. Five sand volleyball courts can be reserved in advance. Some of the games are competitive, and others are just for fun, so you may be able to join in without a reservation if you ask nicely. The courts are located along the edge of the Great Lawn, so there’s plenty of space for chairs and blankets around the courts. There’s also a leash-free area for dogs near the courts, so you can bring a pooch to play with while your companions play volleyball. Located just west of the Mopac highway, the Rowing Dock rents canoes, kayaks and standup paddleboards (SUPs) by the hour. It’s a great way to get a little exercise while seeing the sights around Lady Bird Lake. The slow-moving water on the lake is easy to navigate, even for first-time kayakers. If you show up close to sunset, you can paddle over to the Congress Avenue Bridge and watch the bats emerge. During the day, you’ll also have plenty of birds, fish and turtles around for your viewing pleasure. There’s a large group of picnic benches near the entrance to Barton Springs pool, and there are other benches scattered sporadically throughout the park. However, if you bring a blanket, there are tons of prime picnicking spots. On the edge of Great Lawn, you’ll enjoy excellent people and dog watching, but you may have your meal interrupted once or twice by overenthusiastic pets. See the park map for more details on picnic areas. The Great Lawn is the green space around the Rock Island on the map. While the garden is at its best in the spring, it’s stunningly beautiful year-round. The Taniguchi Japanese Garden offers instant stress relief in the form of tranquil ponds populated with koi, quaint foot bridges and lush landscaping. Aspiring gardeners can learn about what grows well in the Austin climate. Specialized gardens include the succulent and cactus garden, rose garden, butterfly garden and the Hartman Prehistoric Garden. An audio tour can be accessed online. The theater presents free musical performances all summer long. Recent shows have included All Shook Up, The Wizard of Oz and Shrek the Musical. You can spread out a blanket on the hillside and enjoy a picnic during the show. The outdoor setting is ideal for antsy kids who may have a hard time sitting still in a typical theater. The shows themselves are also family-friendly. Starting from its depot at Barton Springs pool, the miniature train known as the Zilker Zephyr takes passengers on a 25-minute ride throughout the park. Kids will have plenty of people to wave at along the way as the train crosses back and forth over the Lady Bird Lake hike-and-bike trail. It’s a low-speed adventure that’s ideal for frazzled parents looking to take a break from herding their kids. The disc golf course at Zilker is one of the few in town that have a full 18 “holes,” or targets. The targets consist of metal baskets surrounded by chains, which clink loudly when you’ve hit your mark. The course is mostly flat with only a few trees to navigate around. The many wide-open spaces at the park are well suited for kite flying. The Great Lawn offers all the space you may need, but you’ll need to be careful to avoid tripping over dogs and picnickers. There are also soccer fields and other green space throughout the park that can be used for kite flying. If you want to participate in an over-the-top kite spectacle, the ABC Kite Festival (usually referred to by locals as the Zilker Kite Festival) is held in early March every year. The sky is filled with thousands of kites handcrafted by kids. They compete for awards such as steadiest kite, strongest pulling kite, largest kite and highest angle kite. The day-long event also includes other activities such as a fun run and a concert. Another great destination for kids, the center has a Dino Pit where the little ones can get dirty and dig for facsimiles of dinosaur bones. The facility is also home to a small number of rescued animals from the area. The animals on display change frequently, but you may get to see bobcats, armadillos, hawks, owls or foxes. And admission is always free. The main entrance to the greenbelt sits on the western edge of the Barton Springs Pool parking lot. The trail starts off fairly easy but quickly becomes rocky about a mile in. Soon, limestone cliffs pop up next to the trail. You will often find rock climbers scaling these cliffs, and sometimes rock-climbing lessons are taught here. The greenbelt extends across about 800 acres, so you could walk for hours if you wanted to. The main trail is about eight miles long, but most people walk for about two miles before turning around. Make sure you wear shoes with good traction. Particularly after a heavy rain, parts of the trail will be covered in water, and boulders will be slippery. Dogs are allowed on the trail, and many of them run off-leash, though that’s technically not permitted here. Bring plenty of water and wear a wide-brimmed hat. Parts of the trail are shaded and parts are in full sun. There are several wide-open spaces in Zilker Park commonly used for playing soccer. If you don’t want to join a league or even go to the trouble of getting several players together, you can join one of many Meetup groups that gather on the weekend and in the evenings to play. Many of the groups bring nets, balls and all essential equipment. You just have to show up ready to play. Keep in mind that these informal spaces are not walled off from the other visitors to the park. At any time, you may have a frisky dog or even a small child try to join your game. Show up with the right attitude, and you’ll all have a fun game of soccer.